On cold winter days like these, it is nice to dream of warm, faraway places. 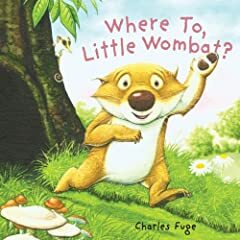 Where to, Little Wombat? will take readers to a warmer climate and offer them an introduction to Australian animals. While Little Wombat’s mom is busy cleaning, Little Wombat dreams of living somewhere more exciting. He sets off to find a more exciting place to live without much success. Readers will laugh when he tries to go places that he just doesn’t fit. He discovers that his home is the best place to be, but a surprise is in store at the end. I was really hungry when I chose this book. The idea of tasting anything was very appealing. How could I resist a story about Max the Royal Cook’s dog—and chief taster–who is desperately trying to save his beloved master’s job—and maybe his head. The Chef is failing miserably in his attempt to convince the obstreperous young King to at least try his food before flinging it across the Royal Dining Room. In an attempt to placate His Royal Pickiness, the Chef and Max travel the world searching out delicacies to entice the persnickety boy. Despite bringing back pizza from Italy, fries from France and chili tacos from Mexico, the Chef is unable to tempt the King to eat any of his delicious concoctions. Things are looking grim until Max, in a fit of insomnia one evening, discovers The Royal Secret. This is the type of story that will keep you in stitches. 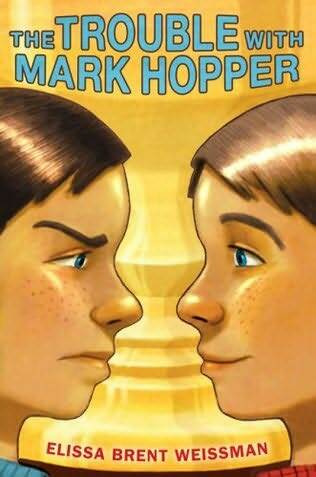 A comedy of errors, The Trouble with Mark Hopper is the story of Mark Hopper and Mark Hopper. There are two boys with the same name who look almost identical. One is a terror and the other is the new boy in town. With plenty of mix-ups, these two boys each become angrier and angrier that they are being mistaken for each other…..until their math teacher makes them work together. Then, they come to realize that maybe they aren’t so different as they thought and that each has his own special strengths. With a style reminiscent of Andrew Clements, Weissman tells a funny story that will have you laughing the whole book through. A great story about friendship and mistaken identities. You have probably heard about the Great Fire of 1871 in Chicago. Some say that it was caused by Mrs. O’Leary’s cow. But is that really how it started? And why did the fire destroy so much of the city. What was it like for the many individuals and families who were trying to escape the flames? How did they manage to recover from the fire? All of these questions and more are answered in this fascinating and gripping account of this historical event. Older children and adults will be amazed by the realities of The Great Fire. The very title of this book immediately sparked my interest and I am certainly glad that it did! This book tells the heartwarming bond between a dog and a man. Be ready to feel moved – whether you are a dog lover or not. While stationed in Iraq, Marine soldier Major Brian Dennis probably never expected to form a bond with a dog. In camp there was a pack of wild dogs hanging around, with a mutt of a dog as the leader. His ears had been cut off to show that he was a dog of war. Of course, he had never had an owner or knew what it was like to be loved. That was all about to change when he met Major Brian, who named him Nubs because his ears looked like little nubs. Brian also gave him food and wonderful belly rubs and taught him some commands. A bond between the Marine and Nubs was formed. When Major Brian and the Marines were relocated, Nubs did something unbelievable. He journeyed 70 miles across the frozen desert until he found where Brian was. The exhausted dog was in poor health, but Brian, along with the other Marines, gave him food and tender loving care. The bond grew stronger. Unfortunately, working Marines are not allowed to have dogs and Brian was told to get rid of Nubs, or else. By now, the bond was so strong between Major Brian and Nubs, that what happened next is truly heartwarming. I hope you are inspired to read this book to find out what happens to Nubs and to enjoy the many photographs of both Major Brian Dennis and the special dog he met while serving our country in Iraq. Horses and girls just seem to go together, and if you are a horse-lover this book is a perfect fit! The main character is Lidie, a 12-year old girl who moves to America from Brazil to be with her father and brother who are horse trainers in New York. Lidie has waited for years for her father to finally be able to send for her, yet once back with her father, she finds that life is not as she imagined it would be. She has a very hard time adjusting to her new world which includes a new school, new language, new climate — so many new and different things and none meeting her expectations. In addition to that, she is homesick for Brazil and still misses her mother who died years ago. And if that wasn’t enough, her father and brother still see her as the little girl they left behind, which she definitely is not. When she lived in Brazil, Lidie was nicknamed “Wild Girl” for her wild and sometimes stubborn nature. Lidie loved to ride horses and is already an expert rider, and yet her father and brother do not know this and arrange for her to learn to ride on a very old slow horse. The story includes little excerpts from stories of famous race horses that somewhat mirror Lidie’s own experiences. Eventually Lidie finds a way to show her father the girl she has become, and this opens the door to a new and more fulfilling relationship with her father and a happier home for all. Helen Stringer is the author of the wonderful new fantasy novel Spellbinder. We’re very excited to share her answers to our questions about writing — and about her newest book! I’ve always wanted to tell stories. I used to tell endless stories to my sister at night after we’d gone to bed. They’d go on and on and on until she fell asleep. I moved on to putting on plays, making short films and writing screenplays, but it was always about the stories. I’ve been writing since I was small, though I rarely finished anything. I’ve got boxes and boxes of good beginnings, though! That’s a hard one. Writing doesn’t seem like a job, really, but I suppose I’d want to be in the film or television industries. It really doesn’t matter much, though – when I worked in an office I used to entertain myself by making all my memos funny. Or just making them up. Most of the rejections came when I was trying to find an agent (you have to have an agent before you can get a publisher. Most people were really nice and made comments and suggestions, nearly all of which were very good. Each time I got a rejection, I’d think about what they said and then go back and do another rewrite. It’s easy to say that people “just don’t get” things that you write, but if they’re not getting it, it’s probably because you’re not making it clear enough. Once I found my wonderful agent, Kristin, we did a few more rewrites and then sent it out to publishers…and they liked it! I always THINK I have a definite ending point…until other people read it (grin). Usually, I write things and then leave them for a little bit before I revise them. I find it’s helpful to get a little distance. Then I ask family and friends to read them. If they have a lot of questions abut the story, I know it isn’t right yet, so I go back to work. I’m not the sort of person who can’t stop tinkering, though – that kind of thing could drive you crazy. Also, it’s a bit like being in a band: you can practice all you want, but you’ll never know if your songs are any good until you get on a stage and play for an audience. The beginning is always the most difficult for me, but once I’m happy with the first few chapters the whole thing sort of takes off and writes itself. I get ideas from all sorts of places: things I’ve read, places I’ve been, something someone says. I’ve always loved history and read a lot of history books, not so much the ones about the major people and events, but the kind that tell us more about the ways that ordinary people lived. You often stumble across absolutely fantastic stories that have been all but forgotten. For example, in the early 1800s an elderly American soldier convinced Napoleon to give him a ship and some soldiers so that he could try to invade England from the west (the idea was that Napoleon would invade from the east at the same time). The soldiers landed on a beach near a small fishing town in Wales, but everything went wrong. Far from meekly surrendering, the women of the village went after the soldiers and imprisoned them in town, then (while the men were negotiating with the would-be-invaders) two girls fell in love with a couple of the French officers, broke them out of jail, stole a yacht belonging to a nobleman and ran away to France where they got married and lived happily ever after. How great is that? It’s like a Jane Austen action movie! I use a lot of history and mythology in my stories, but I’m also inspired by places that I visit and some things from my own childhood. Dulworth’s, the school in Spellbinder, is based on Belvedere in Liverpool, where I went to school — right down to the Victorian houses, the attic, and the buzzers outside Miss Parker’s office. The main thing, obviously, is to just write. If you have an idea, write it down. It doesn’t really matter if you finish it or not, just write what you can and then put it away somewhere. You might never look at it again, or you might look at it one day and suddenly know how to finish it. I would never have written Spellbinder if I hadn’t stumbled across a short story that I wrote years and years ago. It was called “The House with Four Turrets and Five Thousand Windows” and was about a boy who lived in a house that was so big he’d lost his father and the poor girl from the town who helped him. I read it and thought, “Huh. Not bad. I know, I’ll write some more short stories about other people who live in the same town.” I thought I’d start with a girl who could see ghosts – and she turned out to be Belladonna Johnson. The other thing is to read. When you read you absorb so much, not just the story. You drink in words and ideas and ways of saying things. Without even realizing it, you learn to recognize the different styles that different writers have and as you begin writing you’ll probably find yourself adopting the style of your favorite author. That doesn’t matter – just keep doing it and eventually your own voice will break through. For a long time I would try to write in what I thought was a “proper” book kind of way, which took forever and was no fun at all. Now I tend to write the way that I talk, as if I was telling someone a story, and that makes it so much more enjoyable for me because telling stories is what is really fun. And, of course, let other people read what you write. You can give it to them and let them read it, or read it out. Reading stories out loud to people can be a great help, because you can see right away what is working and what is not. If you don’t like reading things out loud, find a friend who is good at reading and ask them to do it for you – you’ll probably discover lots of things you didn’t even realize were there. Can you tell us anything about the sequel to Spellbinder? Or any other books you’re planning for the future? Funny you should ask! I just finished the sequel. It’s called “The Queen of the Abyss” and continues the story as Belladonna and Steve meet the last Paladin, who gives them a map and a dire warning, but before they can do anything about it, Belladonna is taken into care by the authorities (who have just discovered she’s living in an empty house). Her new foster parents are not what they seem, however, and Belladonna, Steve and Elsie must travel to the Other Side to find the ruler of the dead, the mysterious Queen of the Abyss. My favorite children’s book author is Alan Garner. A lot of people in this country don’t seem to have heard of him, but I strongly recommend his books! The best one to start with is probably “The Weirdstone of Brisingamen.” (I know, it’s a strange word and I was never quite sure I was pronouncing it properly until I happened to see him interviewed on television about two years ago. He pronounced it Brizzing-ah-men, which was what I’d thought all along!) I also like Philip Pullman and the “Half Magic” books by Edward Eager, which were out of print for years but are now back (hooray!). I really love cooking and am very interested in the history of food – after all, if “we are what we eat” then what people in past centuries ate should tell us a lot about them. I also collect old newspapers and magazines (pre-1890), which are also great fun to read – some of the stories are absolutely bloodcurdling. And, of course, I watch a simply disgraceful amount of television. For more information about her and her books, visit her website.